Are you considering adding masonry to your home? Perhaps adding a veneer or a wall/fence of some kind? If so you may have struggled with the question of which material to use. In particular you may be torn between two timeless materials: brick and stone. So which is better for your home? Ultimately the decision will be your own and reliant on your project, but we can help you make that decision by taking a look at both materials. Stone Masonry is the shaping of stones into even shapes that can then, with the help of mortar, be combined to form walls, fences, and other structures. These techniques have been used throughout history and can still be seen in residences new and old, and of course the great castles and cathedrals of history. Even the famous Taj Mahal is a work of stone masonry. Long ago stone masonry was always done with natural stone found in the wild and quarried, like marble, granite, and limestone, but now stone masonry can also be done with manufactured stone. Manufactured stone is generally constructed from concrete, marble chips, or other existing masonry materials. You might be wondering now if there are major differences between natural and manufactured stone? The answer is both yes and no. Natural stone is a little harder to find and thus tends to cost more on average than manufactured stone. That said, some high end manufactured stone may actually cost more. Due to major advancements in the creation of manufactured stone, the two materials actually perform relatively evenly across the board and look almost identical, but there are a few key differences. Natural stone is still a little tougher and better able to carry weight, but also heavier and less flexible as a result. Manufactured stone is almost just as durable as natural stone, but it can lose color over time and start to fade. In this article we will mostly be using them interchangeably since the differences between the two are often not that significant. We’ll specifically indicate when this is not the case and we’re referring to only one type. Brick is another popular material that has been used throughout the ages. Bricks are generally made from clay and shale that are heated together in a kiln. They combine to form the bricks you see. These bricks can then be laid on top of each other and connected with mortar to form solid walls. A simple drive around any town or city will confirm the popularity of brick as a building material. Many older buildings especially use brick exteriors. It is clear that both materials have long histories, but which one is better? In order to decide we’ll be comparing their durability, aesthetics, variety, and the cost. Brick is a very durable material. It is extremely fire resistant and resistant to weather, from rainfall, sleet, and hail to strong winds. This durability gives brick an extremely long life. Brick generally lasts about a century, maybe more, and requires very little maintenance for the first 25 years or so of its life. While brick is very durable, stone takes it to the next extreme. Stone is not only extremely resistant to the elements, but also has an incredibly long life, even compared to brick. Stone can not just last a century, but potentially several, as many ancient monuments can attest. It is also extremely hard to disfigure stone with chips, scratches, and dents. Even a sledgehammer will do less damage to stone than it would do to brick. Both Brick and Stone are very durable materials that can potentially last centuries. However, nothing can compare to the sheer immovability of stone. Stone often not just lasts for a lifetime, but several. While it is close, stone is still clearly the winner in the durability category. Both brick and stone come in a variety of different colors and neither suffers from a lack of options. Which material looks better overall is of course a matter of personal taste. It will also be somewhat dependent on the kind of look you’re going for and what the masonry will be complementing. Both are effectively even in the variety they offer, and which looks better is a personal preference. That said, we feel stone offers a lot of flexibility and can be either regal and impressive or warm and inviting. Check out our gallery here for some examples of our stonework at Greenway Industries and see why we find it so appealing. Pricing can be a bit variable depending on several factors. However, natural stone, as a material, tends to be more expensive than brick as it is slightly harder to find. Manufactured stone though is generally very close to brick in price. However, installing natural stone is actually cheaper on average than installing brick. Installing a natural stone wall, on average, costs $10 to $20 less per hour than installing a brick wall. The same holds true for siding, although the exact amount saved is closer to $8 per hour. On average natural stone is probably still slightly more expensive than brick despite being cheaper to install. However, manufactured stone is probably around the same price or slightly cheaper than brick. Ultimately, neither material is conclusively superior price wise. It should also be noted that brick, despite its durability, is more likely to require repairs than stone and these repairs are not inexpensive. Consequently we would actually give the advantage to stone on the price front as it is the more durable of the two, helping to avoid potentially expensive repairs costs, and the better option when the price is similar thanks to its superior durability. Manufactured stone in particular should be about equal to brick in price while providing better results. Brick and Stone are both excellent building materials, of this there can be no doubt. However, we would ultimately conclude that, in general, stone is the better material. 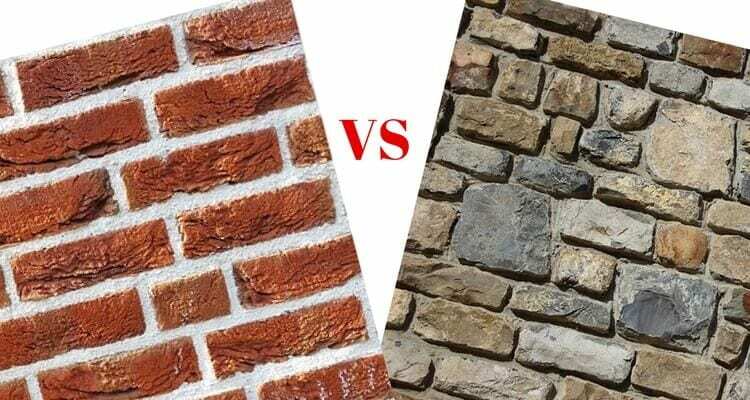 It is more durable than brick, long lasting, and about the same price, potentially even cheaper if using manufactured stone and counting repair costs. Beauty lies in the eye of the beholder, but it is harder to deny that a stone surface is appealing and effective. If you are interested in using stone masonry for your property then look no farther than Greenway Industries. Greenway Industries is your source for trusted and reliable masonry experts in the Danbury area. We have proven experience with natural stone, blue stone, belgian block, and unilock products. Take a look at our previous work here at our gallery. Give us a call at 203-885-1037 and one of our experts can provide you with more information.